1) When cleaning your travertine tile floors vacuum (without the beater bar) or sweep first then damp mop (please damp mop – you’re not watering your lawn) with a mild stone soap (rated for natural stone). Do NOT use vinegar, bleach, ammonia or other harsh cleansers even if diluted with water! In fact, I have been advocating for awhile to use steamers, they use less water, clean very well and dry faster. 2) There are several ways to check your counters and grout. 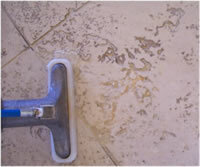 With a slightly damp sponge, squeeze out some water drops on your stone counters or floors. If the water beads up, your seal is holding, if the water is absorbed into your stone it’s time to re-seal. In the shower or tile counters if the water darkens the grout, it’s time to re-seal. Tags: can i steam clean travertine, can travertine countertop be cleaned with steam, can you use steam cleaners on travertine, clean travertine with steam, cleaning travertine floors, grout sealing Plano|Dallas, hot steam travertine tile floor cleaners, is it ok to clean travertine floor with steam?, is it safe to use floor steamer on travertine, steam clean travertine, steam clean travertine floor, steam clean travertine tile floor, steam cleaner travertine floors, steam cleaners for travertine floors, steam cleaning on travertine grout is ok?, steam cleaning travertine floors, steam cleaning travertine Plano|Dallas, steam floors and tavertine floors, steam grout leaning dallas, steamer on travertine, steaming cleaning travertine, travertine cleaning steam, travertine flooring cleaning steam, travertine flooring steam clean, travertine sealing Dallas|Plano, travertine tile steam cleaning, using steam mop on travertine This entry was posted on Saturday, March 20th, 2010 and is filed under Travertine . You can follow any responses to this entry through the RSS 2.0 feed. Both comments and pings are currently closed.